The rising worldwide demand for packet telephony solutions testifies to the fact that more and more carriers view Voice over IP (VoIP) technology as the best way to achieve their business goals in a highly competitive marketplace. This is reflected in a recent report by Infonetics Research, which projects a CAGR of 125 percent for the global carrier VoIP equipment market – from slightly over $1 billion in 2002 to nearly $4.3 billion in 2006. In today’s competitive market, long distance call volumes continue to increase, however carriers’ average revenues per minute are declining. In the national (domestic) long distance market, the move to less usage-sensitive structures, often flat rate, puts tremendous pressure on carriers to reduce costs. In addition, the huge growth and increasing affordability of mobile communications, as well as DSL technology, have resulted in a reduction in total access lines. At the same time, carriers have made substantial investments in IP infrastructure to meet the explosive growth in Internet traffic. In such a business climate, carriers require a network solution that will enable them to increase margins and capture market share. Next generation network (NGN) technologies address these challenges by shifting voice onto flexible and scalable IP networks. Migration to a convergent IP infrastructure, supporting a variety of voice, video and data services, allows carriers to optimize network efficiency, improve margins and shorten their ROI period. Migration to NGN provides immediate operational savings and efficiency improvements, significant enough to justify initial investments. For instance, VocalTec’s Essentra™ SIP-Based Softswitch Architecture provides a 14 times improvement in number of ports per rack and significant reductions in space, decreasing the number of racks for a switch from 28 in the TDM world to two (2) in the IP world. Reductions in air conditioning and power costs alone allow carriers to recoup the cost of a new softswitch in only 18 months. For purposes of comparison, the cost of most circuit switches needs to be spread over more than 10 years. NGN enables carriers to create new revenue opportunities and to get to market quickly with attractive and innovative multimedia services that are not possible in the TDM environment. Moreover, carriers can benefit from increased IP traffic coming from other national or international long distance carriers already operating VoIP networks, residential local networks, enterprises and mobile networks, all of which are migrating to IP-based voice infrastructures. Prepaid VoIP calling cards, IP Centrex and IP PBX are good examples of voice applications that are driving new IP minutes. The Essentra™ SIP-Based Softswitch Architecture is an open, flexible next generation platform that enables seamless mediation of services between PSTN/SS7 and next generation networks. 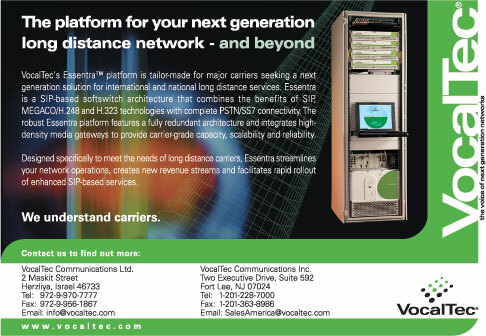 This scalable, carrier-grade platform integrates the benefits of SIP, MEGACO/H.248 and H.323 technologies. Industry-leading SS7 capabilities ensure global connectivity to PSTN/SS7 networks allowing carriers to leverage existing IN services alongside innovative SIP services. Leveraging VocalTec’s extensive VoIP experience and unique RapidFlo™ routing engine, Essentra offers high quality voice services, carrier grade reliability and maximum service flexibility. Essentra supports core networking applications such as International Long Distance (ILD) and National Long Distance (NLD) for transit services with end-to-end signaling and transparency, as well as easily integrating with a rich set of enhanced applications such as VoIP VPN, Calling Card, IP Centrex, and hosted PBX. Like most softswitches, Essentra disaggregates the switch elements, separating the call control and the media processing into separate layers. 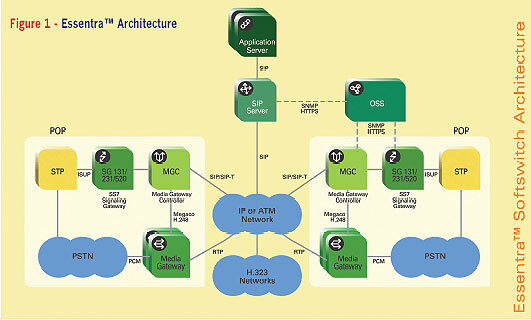 However, what is truly unique is that VocalTec has taken this disaggregation one step further by separating the call control into a Media Gateway Controller (MGC) function and a core call/session function based on the SIP protocol (the Essentra™ SIP Server). This results in an order of magnitude improvement in resources and performance, as well as reducing the number of points of provisioning, control and overall management (centralized or distributed as necessary). Using a centralized SIP Server call model lets the carrier choose which calls get specialized treatment (using either IN or SIP service triggering), while others simply get routed to their destination. Thus, carriers are able to maintain unified IN service logic both during and after migration to large-scale IP-based next generation networks. This preserves revenue from high-margin IN services, as well as enabling the deployment of new SIP-based services using SIP and/or PSTN endpoints. Maintaining the dialling plan in a centralized location means that changes can be made “on the spot”, rather than having to update each MGC in the network separately. The result is that changes that can take up to one month to implement in a circuit-switched bilateral network can be done “dynamically” in a few seconds using Essentra. In addition, introducing services in a central location that is “network smart” simplifies network management and allows for quicker time-to-market. NGNs must have the capability to handle existing TDM traffic, which will continue to constitute the lion’s share of the carriers’ business in the foreseeable future. In this regard, Essentra’s interworking support for over 60 international SS7 signalling variants and interworking with PRI/CAS and other local variants is crucial for global PSTN connectivity. Having SIP at the core enables carriers to enjoy the benefits of an open, distributed architecture and flexible creation of innovative SIP-based services. By strictly adhering to open SIP standards and using SIP Servlets, carriers gain maximum flexibility in the creation and quick deployment of new enhanced services. No longer “locked” to a particular switch manufacturer, carriers can develop their own customized services for specific target markets. VocalTec’s RapidFlo™ step-based routing engine ensures maximum flexibility and rapid implementation of changes in routing logic. Call routing can be based on a wide variety of user-defined parameters, such as E.164 prefix, time and date, load balancing, resource availability, locality-based, percentage-based and least cost routing. Intelligent and flexible routing increases throughput and quality, while lowering operational costs and maximizing use of network resources. VocalTec has developed an approach that enables incumbent carriers to migrate their core networks painlessly and gracefully to NGNs. Our migration concept is based on our rich knowledge and vast experience in working with carriers and replacing and/or interfacing with their TDM networks, as well as the unique features and architecture of our Essentra platform. The Essentra softswitch architecture supports seamless migration from existing TDM or H.323 networks that is manageable for carriers and transparent to their customers. VocalTec’s Essentra softswitch gives carriers a migration path to NGN VoIP through measured, low-risk transition steps that eliminate service disruptions and downtime, and ensure continuity of customer services. Moreover, Essentra’s open, standards-based architecture allows it to integrate with complementary products from VocalTec’s best-in-class vendor partners. The business case for VoIP is based on immediate, substantial operational savings and reduced capex in the short term, coupled with the potential for increased revenues and market share from multimedia, real-time IP services in the longer term. This business case, together with the continual improvements and maturity of VoIP technology, have brought carriers and service providers to the conclusion that NGNs are the best way to realize their business strategy. VocalTec offers a highly advanced platform and painless migration approach, designed to allow carriers to maximize their existing investment and maintain service levels, while creating the infrastructure for new services and revenues in tomorrow’s “all-IP” world.